I have been participating in blog carnivals for a few months now, almost as long as I have been blogging. 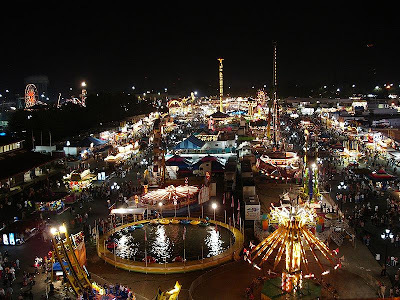 A blog carnival is the literary equivalent of the photo above - an eclectic mix of rides (the blog posts), loosely organized around a midway (the host blog), promoted by a crazed barker (the host). I have enjoyed "meeting" other bloggers through these carnivals. Participating in carnivals has increased my readership, especially when I hosted a carnival myself for the first time. I didn't realize that blogging etiquette suggests that I should help advertise the carnivals I participate in. Advertising on my fledgling website is not like advertising during the Super Bowl, but every little bit helps. Starting with the carnival having the broadest of scopes, Scientia Pro Publica publishes twice per month on science, medicine, the environment and technology. The latest issue is at Reciprocal Space, and includes my post on Thomas Jefferson's arguments against the Theory of American Degeneracy. Click here to see the Scientia issue hosted at Kind Of Curious. Following the science and environment path, we soon come to a clearing in the woods. All around us are odd creatures in various stages of development. We must be at - The Carnival of Evolution. This month's edition, at Mauka to Makai, also includes my post on American Degeneracy (just doing my part by recycling and reusing old material). Continuing our stroll, branching off down the Animalia trail, we come to another carnival with a pretty broad scope - the Friday Ark. I missed the launching of last week's ark, but the week before featured my post on coyotes sneaking into Manhattan. Continuing down the Animalia trail, we stop to study a small insect. That's right, it is an invertebrate, so we must be at Circus of the Spineless! This month's issue, at The Modern Naturalist, starts off with my article on how arachnid lungs evolved from those of horseshoe crabs. Kind of Curious will be hosting Circus of the Spineless in July. The invertebrate path in our carnival blogosphere has a big hole where "insects" should be. I think I smell an opportunity for a new carnival ... or maybe that's just a stink bug. Anyway, we turn down another branching pathway toward the biggest order of insects. This next carnival has An Inordinate Fondness - for beetles. This carnival set up its tents for the first time last month, and it included my post on the Ponderous Borer. Next, it's off on a trail toward a sub-order of insects. I have not yet submitted a post to The Moth and Me. But I have a really cool photo of a tomato horn worm (hawk moth caterpillar) being attacked by wasp larvae. This will make a great article - as soon as I can find the photo. Thankfully the invertebrate path does not branch off any further. Now we hop over to a parallel path for reptiles and amphibians. House of Herps is a new carnival, and issue #4 will be hosted right here at Kind Of Curious in just one week. I missed last month's issue, but the prior month at Beetles in the Bush included my post on diamondback terrapins. As we tire of casting our eyes toward the ground, we look up to the skies and see - birds. I admit that birds are not my most frequent subject, so I do not submit posts every fortnight to I and the Bird. My last was back in January, uniquely hosted at The Marvelous in Nature. Each post is illustrated by a hand-drawn bird. Mine is the Chukar Partridge on the right edge, about 2/3 of the way down, at the base of the bird feeder. Next we leave the Animalia path and head over to Plantae. Berry Go Round is a monthly carnival on all things botanical. The latest issue at Foothills Fancies features my article on the Haleakala Silversword. Our plant-lined path now "branches" off onto a tree-lined boulevard. Trees are another topic I don't blog on very often ... a great goal for 2010. My last post at Festival of the Trees was in the January issue at Xenogere. It is my post on the Indian Kapok tree (look for the trees described as "godlike with their magics and powers and untold beauty"). The tree-lined boulevard finally leads to the water's edge, into the Carnival of the Blue. This month's carnival is at Southern Fried Science, and it includes my post on terrapin evolution.